Use your gifts to enrich the troubled teen camp at Triangle Cross Ranch. Triangle Cross Ranch Youth Ranch is a Catholic troubled teen camp located in northwest Wyoming (around 85 miles from Yellowstone National Park) that gives at-risk youth a new beginning. Our form of therapy is based on Reality Therapy, using animal therapy, experiential education, religious education and vocational training to increase self-esteem, self-motivation, self-discipline and proper coping mechanisms to the at-risk youth. 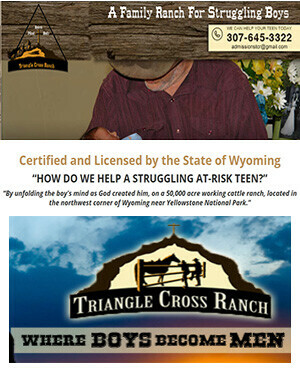 Triangle Cross Ranch Mentor is responsible for providing care and welfare of assigned youth. Maintain control and develop a healthy learning environment. They must follow established guidelines, rules and regulations set by Triangle Cross Ranch and Department of Family Services (DFS), and be familiar with those rules and regulations. The Mentor must possess high moral and ethical standards with a strong Christian/Catholic background. They must live with the at-risk youth, monitor their activities, and maintain harmony through good examples and relationships. This allows opportunities to share Triangle Cross Ranch Christian philosophies with youth and find the goodness within while providing direction in returning home. The Triangle Cross Ranch Mentor must be able to physically work hard and encourage boys to do the same through a good example of a solid work ethic. Ranch hand labor such as irrigation, fence building/repair, carpentry, large animal care, driving heavy equipment and late hours are all part of the ranch life. Triangle Cross Ranch is a learning opportunity with nature, in a ranch environment, set in “cowboy” culture and tradition. The Mentor will learn to portray the cowboy way of living through dress and appearance and traditional ranch work. The Mentor needs to be a strong person that will not be easily manipulated by the boys, yet has empathy for each boy’s situation. The Mentor will maintain a written log of daily activities accounting for each boy’s attitude inside and outside. The Mentor is responsible to ensure that all meals are nutritious and follow proper food handling procedures. Provide a family dining atmosphere when possible, using proper table manners, and cleaning up after meals. All persons applying must have a valid Driver’s License. CDL license is a plus. Do you know an at-risk teen? Call Triangle Cross Ranch for more information on our Wilderness Program and School for Troubled Teens. We can help!